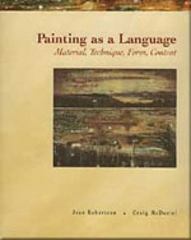 Painting as a Language 1 Edition Designed to address the issues of how to paint and what to paint, PAINTING AS A LANGUAGE covers a wide range of information of central importance to beginning and intermediate painting instruction. The authors emphasize the value of the student's cognitive understanding of the process and potential of painting in the student's overall progress in the studio. Blending journal writing with painting and drawing exercises, they guide the student through selecting meaningful subject matter as well as becoming adept at shaping and interpreting that material through the language of painting.